It’s a would-be man’s world dominated by a wonder woman in ABC’s latest effort to flex its Marvel muscle. And Marvel’s Agent Carter -- always put the brand name before the merchandise -- indeed again looks Marvel-ous from a production standpoint at least. After a while, though, ennui might start to set in. That is, unless you’re an idolatrous fan who would still buy a Pet Rock were it labeled Marvel’s Pet Rock. 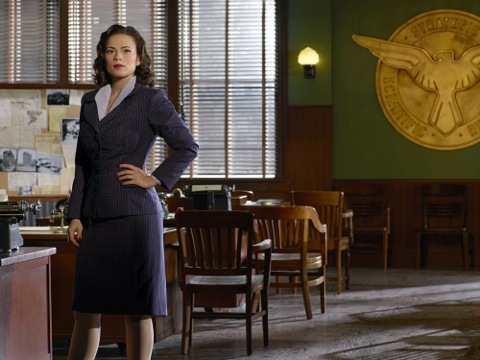 ABC, which has had limited success with Marvel’s Agents of S.H.I.E.L.D., launches Agent Carter with back-to-back episodes Tuesday. They’re followed by a Forever chaser in hopes of still saving that first-year series. The heroine, Peggy Carter, punches, kicks and subdues a succession of male brutes while still chafing at being left to do post-World War II “women’s work” for the covert SSR (Strategic Scientific Reserve). ABC bills it as a seven-part “television event” that also serves as a bridge between the fall and winter seasons of S.H.I.E.L.D. Britisher Hayley Atwell reprises the title role she’s played in the movies and in two S.H.I.E.L.D. episodes. It’s New York, 1946, and Carter is still mourning the apparent plane crash death of Captain America, also known as Steve Rogers. “I seem to have a habit of losing people closest to me,” she laments after a second fatality hits close to her new New York home. There’s little time to mourn, though. The SSR’s in hot pursuit of energy company magnate Howard Stark (guest star Dominic Cooper), who’s highly suspected of selling the lethal chemical Nitramene to sinister forces who would use it to wreak havoc and the like. Carter, who tells her civilian friends she’s works at the phone company, knows Stark from a previous life. So when he rather magically contacts her in person, she clandestinely seeks to prove his innocence by catching the bad guys on her own. One of them tells her, “Leviathan is coming.” Uh-oh. The slugs at SSR, headed by Chief Roger Dooley (Shea Whigham), must be kept in the dark. This sometimes requires some doing, as when Carter asks for a day off because of “ladies’ things” before flaunting her other ladies’ things as a disguised blond bombshell in a low cut dress at a swingin’ nightclub. Of course she gets what she wants. Carter occasionally is assisted by Edwin Jarvis (fellow Brit James D’Arcy), the butler that Stark has left behind to aid and assist her secret investigations. But can the genteel Jarvis entirely be trusted? No one is quite as they seem, it seems. And haven’t we all heard and seen that before? Tuesday’s Episode 2 ushers in old Twin Peaks stalwart Ray Wise as a sneering industrialist who used to be big pals with Stark. This is just after Carter’s boss at the SSR orders her to “get wigglin’ “ with her file work. No wonder she’s beating the hell out of bad guys with a regularity that Chuck Norris used to deploy in Walker, Texas Ranger. One of the better sequences in Agent Carter finds Peggy pounding away again while a simultaneous radio serial -- The Captain America Adventure Program -- portrays her as a “defenseless sweetheart” always in need of rescuing. Some of the fight scenes are dimly lit and shot in extreme closeup, making them a mass of arms and legs. That makes it easier to use stunt doubles, but harder for viewers to get engaged. The oft-picture perfect period sets rival but don’t quite exceed those of Fox’s Gotham. And the big, bold music is straight from all those big-screen Marvel action movies. Atwell brings some presence to the lead role, flashing specs of vulnerability while mostly keeping her shoulder to the wheel. “I can’t tell if you’re being arrogant or ignorant,” Jarvis tells her in Episode 2. “Both I imagine,” she concedes. Those who swoon at the name Marvel are likely to be entertained anew by a short-run series that pushes all those familiar buttons before the next feature film attraction kicks in with bigger stars, bolder visuals, better battles and a tease for the next one. Iron Man’s Explosive Christmas may not yet be on the drawing boards. But now that the idea’s been broached . . .